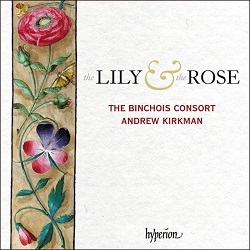 This CD came to me towards the end of July 2018, but – an interesting coincidence – its official launch date was scheduled for August 3rd, and on that very date I went to Hereford Cathedral to hear The Binchois Consort perform at the Three Choirs Festival. Several of the pieces were heard live, for example (quoting Andrew Kirkman’s essay) the beautiful “jewel-like” motets of Cooke and Dammett. But to start at the beginning. The musicians attempt to capture the inner spirit of late 14th and 15th century English music with reference to the amazingly beautiful, contemporary alabaster sculptures. Such sculptures are to be found in various museums and indeed churches not only in the England but also across the world. In the wonderfully illustrated 28-page booklet we have detailed essays by Andrew Kirkman and Philip Weller, and the texts and their translations alongside superb colour photographs of various alabasters which relate to the themes of the CD. These are the major concerns of medieval people in relation to their devotion and prayers offered to the Virgin: Intercessions against Plague, The Annunciation, The Assumption and The Lineage of the Virgin. The CD follows on from the group’s last, entitled “Music from the 100-years war”. That disc also included illustrations but this one is even more lavish. For example, the centre spread is completely devoted to one of the most beautiful reliefs, the Tree of Jesse from the Victoria and Albert Museum. Another alabaster on this subject is set against the texts for the last section of music, The Lineage of the Virgin. Other illustrations are also beside the relevant texts. The composers represented here offer a link between those of the Old Hall Manuscript (c. 1410) and of the Eton Choirbook (c. 1480-1490). One of them, much lauded by Kirkman, is John Plummer with his highly sophisticated and elegant counterpoint as found in his Anna mater, matris Christi. The performances are of the highest quality. Some of the pieces will transport you into a most beautiful landscape. I am especially thinking of the setting of Sancta Maria, succerre miseris by Bedyngham. A slightly more complex setting by Dunstaple is also included, and Qualis est dilectus, a setting from the Song of Songs by John Forest. He is an extraordinarily original composer whose few surviving motets are testament to his little-appreciated genius. The main work, broken up in each of the sections, is Walter Frye’s mellifluous Missa Flos regalis. This was recorded by the Hilliard Ensemble in 1992 (on ECM 437684-2) in an equally easily paced and beautifully sung performance with Frye’s various motets. Also you might be able to track down a less successful recording of the Mass on Signum (SIGCD0150) sung by the Clerks’ Group. The significance of the mass is to aid thinking of the Virgin as the equivalent of a ‘Royal Flower’, an epithet used along with the ‘rosa sine spina’, and as ‘Virgo mater comparoboris’ as represented elsewhere on the disc. The other theme running through the music on this disc is the popular song So ys emprentid by Bedyngham which uses as a contrafactum the motet Sancta Maria, succere miseris and as the basis of Kyrie by Frye and the setting of Stella celi extirpavit by the shadowy Guillaume Le Rouge, interesting to compare against the simpler one by the Old Hall composer, Cooke. It is interesting that much of music of Walter Frye and other composers of the mid-fifteenth century is almost entirely found in continental documents. I suspect that this can be accounted for by the wonton destruction of illuminated manuscripts at the Reformation. The Binchois Consort is, to my knowledge, the only small, all-male consort which is conducted. At first that might seem odd, yet it does seem to lead to a firm unanimity of interpretation. The only reading I did not especially enjoy was the rather breezy way Kirkman has with the Ave Maris Stella setting by Dunstaple, which lacked poetry and the usual effortlessness. Also I am not really sure if attempting a proposed medieval pronunciation of the Latin helps the music, sounding a little ‘mummerset’ especially at the end of phrases. The recording is perfect, as are all other aspects of the performance although some listeners may find that the balance favours overmuch the counter-tenor lines. So all in all this is highly recommended to all.